To my way of thinking, gazpacho is always lipstick red (chock full of the ripest tomatoes), jade green (Asian-style), or even bluish-purple (my playful take on a fruit soup made with blueberries and ginger.) These can all be found in Radically Simple and they are a fabulous prelude to an end-of-summer meal. But true gazpacho, according to Spanish food-and-wine maven, Gerry Dawes, has a kind of orange-red-coral hue. Offered with a “lazy Susan” of garnishes — fresh chopped tomatoes, red and green peppers, cucumbers, onion (or scallions — not authentic), chopped egg, warm croutons, the base of the soup is rather smooth and made textural with these colorful add-ons. Today, in Spain, says Gerry, “it has become a trend to add chopped Iberico ham” to the hit parade of toppings. 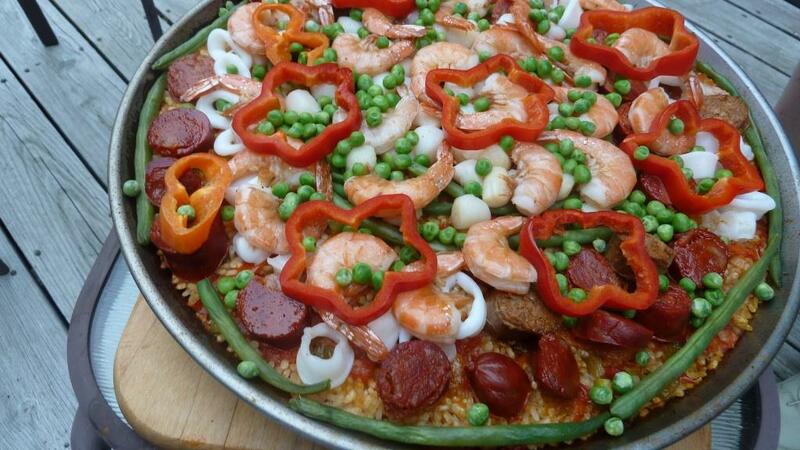 Over the Labor Day weekend we enjoyed the fruits of Gerry’s labor, as he showed us step-by-step how to make gazpacho, then regaled us with an authentic paella laden with shrimp, squid, two kinds of chorizo, rice awash in homemade fish stock, peas, and peppers — all cooked in a huge paella pan set atop an outdoor grill. The goal (and trick) is to get the bottom of the rice to form a nice caramelized crust (socarrat), that is both desirable and delicious. Gerry did. You should see him in the kitchen: the culinary equivalent of a matador. Gerry Dawes was deemed by the late James Michener, to be the rightful heir to scribe the sequel to Michener’s Iberia. Known by many to be one of the leading experts on Spain’s gastronomic scene — both past and present — he is the recipient of Spain’s prestigious Premio Nacional de Gastronomia (National Gastronomy Award) in 2003 and is a familiar figure on Spain’s restaurant circuit. But as food and wine is part of history and culture, Gerry’s vast knowledge of Spain, and his beautiful writing style earned him that opportunity by Michener himself. Gerry, however, is so busy entertaining friends, making gazpacho, and bringing famous chefs to Spain, that the reality of his novel still awaits. Gerry has lived on-and-off in Spain for 30 years and his travel notebooks alone are worth stealing. He was the first American journalist to write about Catalan star chef, Ferran Adria for FoodArts (they are now good friends). According to Michael Batterberry, FoodArt’s late beloved publisher and editor, “…That we were the first to introduce American readers to Ferran Adria in 1997 and have ever since continued to bring you a blow-by-blow narrative of Spain’s riveting ferment is chiefly due to our Spanish correspondent, Gerry “Mr. Spain” Dawes, the messianic wine and food journalist raised in Southern Illinois and possessor of a self-accumulated doctorate in the Spanish Table.” Whew. I couldn’t have said it better. 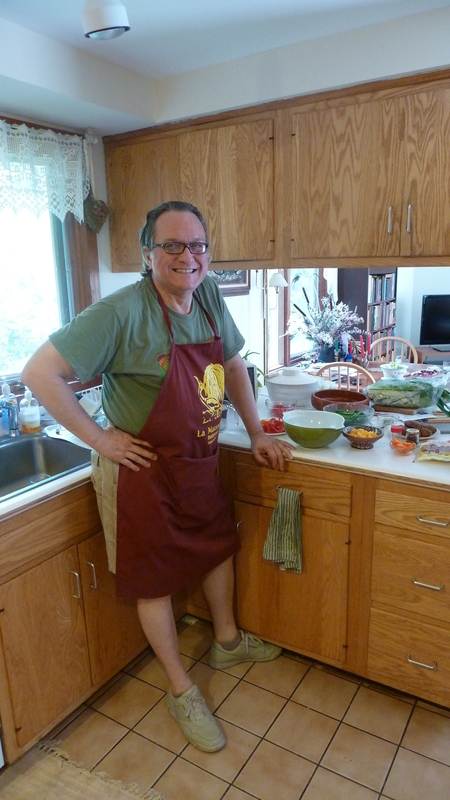 So, it was Mr. Spain last weekend, who finally taught me the gospel-of-gazpacho. No hot spices (the heat come from the garlic), the proper texture, the requisite color, and the most fabulous taste. I took notes and you will find my approximation below. 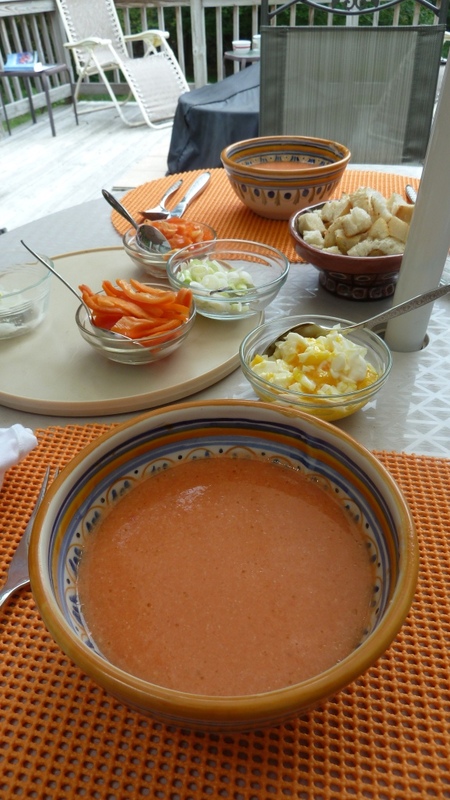 His is the Gazpacho a la Sevilliana — taught to him by his “Spanish mother” Maria Franco, the proprietress of Pension Santa Cruz located in the old Jewish quarter of Seville. In the old days, it cost $1.00 a night and an extra .15 cents for a hot shower. Gerry differentiated his Sevillana gazpacho from the more brick-colored, thicker, sauce-like salmorejo gazpachos of CÃ³rdoba, which are often served with strips of fried eggplant. Gerry says the base of gazpacho is primal — water, vinegar, garlic and bread. My life is not complete without a good Spanish summer gazpacho. My suegra’s (mother-in-law’s) recipe calls for cloves, cumin and paprika in addition to the ingredients mentioned above. But, as anyone will tell you, no two gazpachos are alike (or tortillas).